In the above line chart, I am plotting the one year daily performance of the S&P/TSX Composite Index with an overlay (blue line) of the one year performance of CurrencyShares Canadian Dollar Trust ETF (ticker:FXC). The S&P/TSX Index is trading in an intermediate uptrend and is attempting to hold above the 12,800 support level. The Canadian dollar ETF is in a near-term downtrend with a break below the support level of $99.00 which was the November, 2012 reaction low. From a visual inspection of the above chart, it is evident that the two normally trade together as confirmed by the correlation coefficient at the bottom of the chart. The January, 2013 negative divergence is easily identified on the chart. If the positive correlation between the TSX Index and the Canadian dollar is still relevant, then either the TSX trades down or the Canadian dollar trades up. At this stage in the market, I do not forecast an uptrend for the dollar so one can conclude that the TSX Index will not advance much more is this intermediate uptrend. The Canadian dollar has lost some of its luster as a petro-currency and safe haven investment. Referenced the last chart analysis for the S&P/TSX Composite Index. 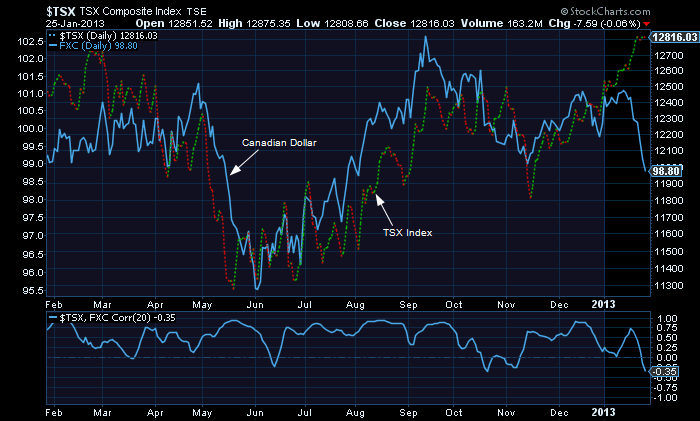 This entry was posted in TSX Index and tagged divergence, TSX on January 25, 2013 by Trader.